A versatile energy-saver. 2-part spray foam expands after it's applied, creating an effective thermal and moisture barrier. Thanks to its unique properties, it can be used to solve comfort & energy problems in many parts of the house. The insulation "team" that's supposed to make our homes comfortable and energy efficient is truly a motley crew. In the old days, sawdust was sometimes dumped inside walls to slow heat loss. Then came vermiculite — porous lightweight pebbles with the look and feel of kitty litter. Today we still rely on an old-timer, fiberglass batt insulation that's made from spun glass fibers. But if you're looking for a star player on the insulation team, a standout with qualities that other types of insulation can't touch, it's got to be spray foam. More specifically, we're talking about closed-cell polyurethane spray foam. Increase your comfort and decrease your energy bills with spray foam insulation in Vancouver, Salem, Hillsboro, Portland, Salem and nearby cities and towns such as Keizer, Woodburn, Wilsonville, McMinnville, Tualatin, Newberg, and more. Josh Lowe's Dr. Energy Saver is your trusted spray insulation contractor in Oregon. 1-part foam: You've seen and probably used this type of spray foam, which comes in pressurized cans that are sold at home centers and hardware stores under brand names like GREAT STUFF™. This single-component foam is super-sticky, and expands at different rates (depending on the type you buy) immediately after application. Since it seals gaps as well as insulates, this product is often referred to as an "insulating foam sealant." R value. Poly spray foam has a higher R-value per inch than any other commonly used insulation —R-6.2 or higher, depending on the formulation. Waterproof: Moisture will soak its way through fiberglass and cellulose insulation, but polyurethane spray foam stops it cold. Its closed cell structure means that water can't migrate from one tiny cell or bubble to a neighboring one. Foolproof: Did you know that a void (missing insulation) of just 5% of an insulated area can diminish overall insulation performance by as much as 50%? 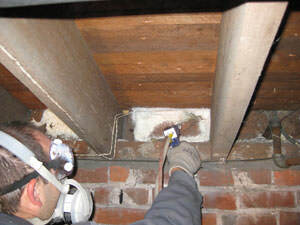 It's very difficult to install fiberglass insulation perfectly, so voids are not uncommon. But spray foam's expanding, super-sticky characteristics just about eliminate the possibility of voids. And once the foam cures, it's not going to settle or shift like fiberglass or cellulose can. Spray Foam Can Be Troublesome to Apply by Yourself! Tricky: It takes experience to get the feel of applying spray foam, especially two-part foams. With their different expansion rates and other qualities, they prove difficult for someone without experience to get the most of this material. For example, a high-expanding foam will damage a door or window jamb, but our training and experience can prevent this from happening. Oftentimes, spray foam can also be wasted and get messy -- but our fully trained specialists know how to get the job done well the first time! Temperature sensitive: Cold temperatures affect the chemistry that causes the foaming action. It's critical to keep spray foam cans or two-part foam canisters within a specific temperature range for successful application. Be sure to check out our comparison between spray foam and rigid foam insulation. We also provide assistance in choosing the best spray foam insulation. Get Your Spray Foam Cost Estimate Today! Contact us today for a Free Estimate -- we are your trusted spray foam insulation contractor in Eugene, Salem, Hillsboro, Portland, Salem, Keizer, Woodburn, Wilsonville, McMinnville, Tualatin, Newberg, and more.